Nokia 3 was launched in February 2017. Nokia 3 features a 5 inch-IPS LCD HD display with 1280 x 720-pixel resolution with a 16:9 ratio. It has a 2.5D sculpted Corning Gorilla Glass display on top. 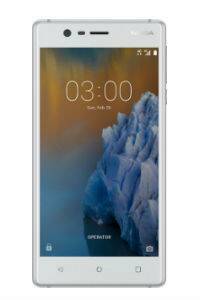 Nokia 3 comes with 2GB RAM and 16GB storage and is powered by 1.3GHz quad-core MediaTek 6737 processor. Nokia 3 runs Android 7.0 Nougat. Nokia 3 features an 8MP rear camera with autofocus, f/2 aperture, 1.12um and LED Flash. The front camera is also 8MP with autofocus, 1.12um, f/2 aperture, FOV of 84 degrees, and display flash. Nokia 3 has a non-removable 2,650 mAh battery. Sensors on the Nokia 3 are Accelerometer (G-sensor), ambient light sensor, e-compass, gyroscope, proximity sensor, and NFC for sharing. Dimensions of the Nokia 3 are 143.4 x 71.4 x 8.48 mm. Nokia 3 comes in four colour options- Tempered Blue, Silver, Matte Black, and Copper. Nokia 3 is priced at 139 euro (Rs 9,800 approx).